Rice Bran Oil is truly "The World's Healthiest" edible oil, a natural source of vitamin E complex. It contains many antioxidants such as Gamma Oryzanol,Tocopherols,Tocotrienols, Phytosterols, Polyphenols and Squalene and other micronutrients that helps in fighting free radicals and combating the effects of aging. In addition, its Trans Fat Free (TFT) and Rice bran oil has more of these components than other cooking oils. Thus, the components of rice bran oil not only gives it an outstanding shelf life, but also help in lowering cholesterol, fight diseases, enhance the immune system etc. The viscosity of Rice oil is very light, Foods cooked with Rice Oil absorb up to 15-20% less oil! Less oil absorbed means reduced calories, lighter tasting food and enhanced flavor. Less oil absorbed also makes it more economical. Rice Bran Oil is hypoallergenic. An excellent alternative for those who have an intolerance and are allergic to other cooking oils. Rice bran oil has a very high smoke (burn) point, making it suitable for deep frying, pan or stir frying and is a premium choice for the replacement of hydrogenated oil containing trans fat now being used in deep fryers. Rice bran oil creates less polymers than other oils meaning better flavor and easier clean-up. Rice Bran Oil is extremely light, versatile and delicious. Use it to fry, saute, in salad dressings, baking, dipping oils and where ever you use cooking oil. Once you use it you will be amazed cooking light and healthy with better taste. The American Heart Association (AHA) recommends the average intake of fat should be 30% of your total calories intake. This fat intake should consist of balanced fats, which provides nutrients that are essential to sustain life. A Balanced fat intake should contain approximately 30% saturated fat, 33% poly-unsaturated fat, (containing Essential Fatty Acids) and 37% mono-unsaturated fat. Rice Bran Oil has the best balance of saturated, monounsaturated and polyunsaturated fats as recommended by such organizations as the American Heart Association and the World Health Organization. It's the oil of choice for improving serum cholesterol levels and preventing cardiovascular diseases. Rice bran oil is popular in several countries such as Japan, India, Korea, China and Indonesia as cooking oil. It has been shown that RBO is an excellent cooking and salad oil due to its high smoke point and for its delicate flavor. RBO is known for reducing cholesterol and cardiovascular diseases. 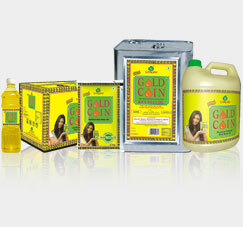 Gold Coin Refined Rice Bran Oil is 100% Pure & safe cooking oil containing micronutrients like Vitamin E Tocopherol and Tocotrienol with HI-ORYZANOL. 4000 ppm and above.